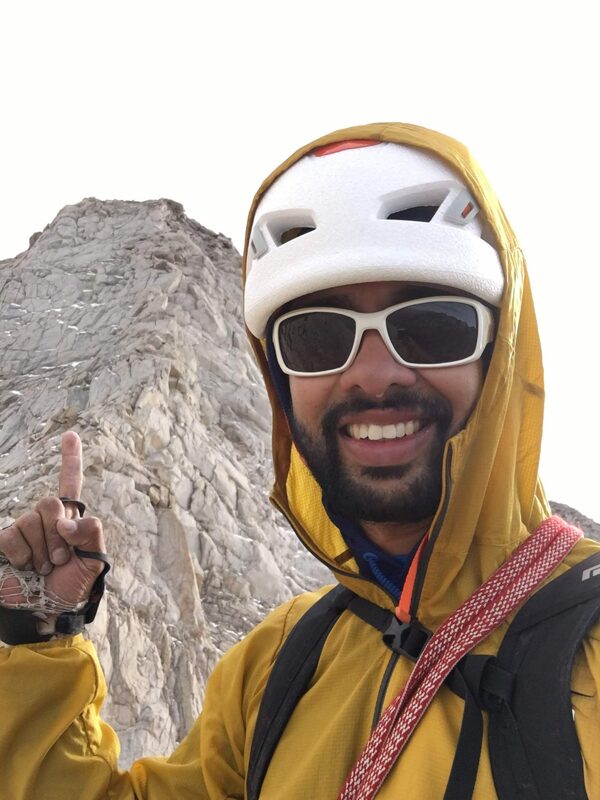 Peakbagging is a form of emotional consumption, a sign of a climber overwhelmed by the desire to collect, if there is such a thing as spiritual materialism, it is displayed in the urge to possess the mountains rather than to unravel and accept their mysteries. 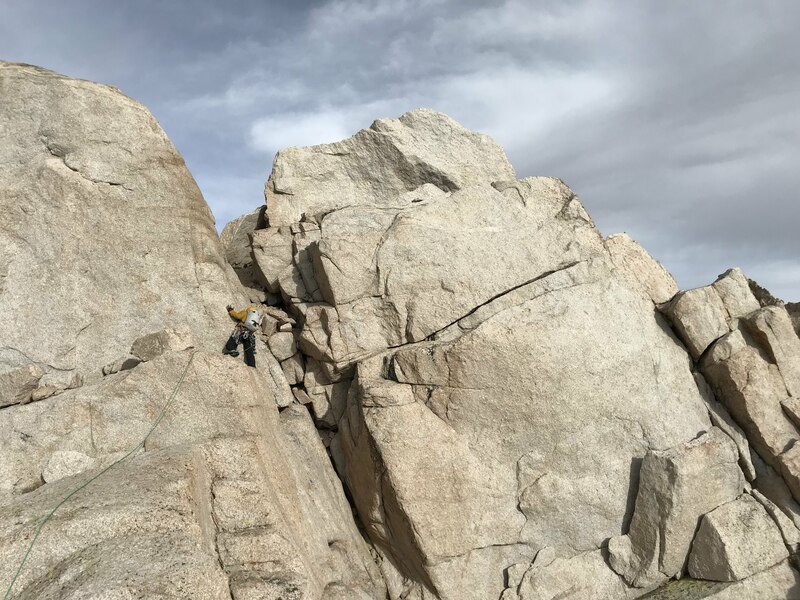 On November 3rd, 2018 my friend Scott and I climbed the North Ridge of Lone Pine Peak. Scott had never been on this route while this was my second time attempting the North Ridge. Two years ago, my friend Jesse and I had attempted the same route in summer but had to turn around because of the heat. The temperature at about 10,000 feet was around 80 degrees F at 9 am in the morning! The town of Lone Pine was suffering from a heat wave, with a predicted high of 110 degrees F. This time around in November though we had perfect weather. The winds were low at 15 miles/ hour and daytime temperature around 50 degrees F . Perfect weather to send in the alpine!!! 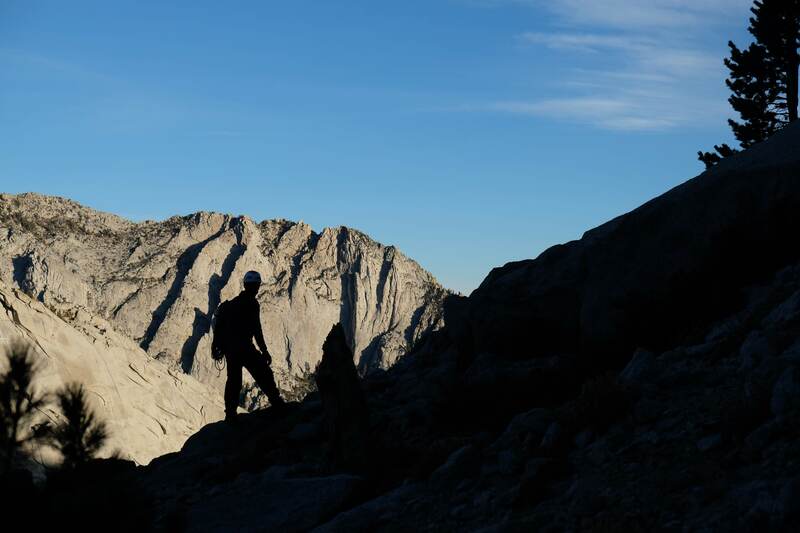 Just like many other Eastern Sierra mountains, the first ascent of this peak took place during the golden age of Sierra Nevada exploration (1925) by Norman Clyde. The first ascent route was a talus and scree filled chute on the Northwest slope, now part of the Maysan Creek trail route (our descent route). The first winter ascent of the mountain took place via the same route, 46 years later on January 17, 1971, by the team of Bob Boyles, Roy Keenan, Frank Snively. 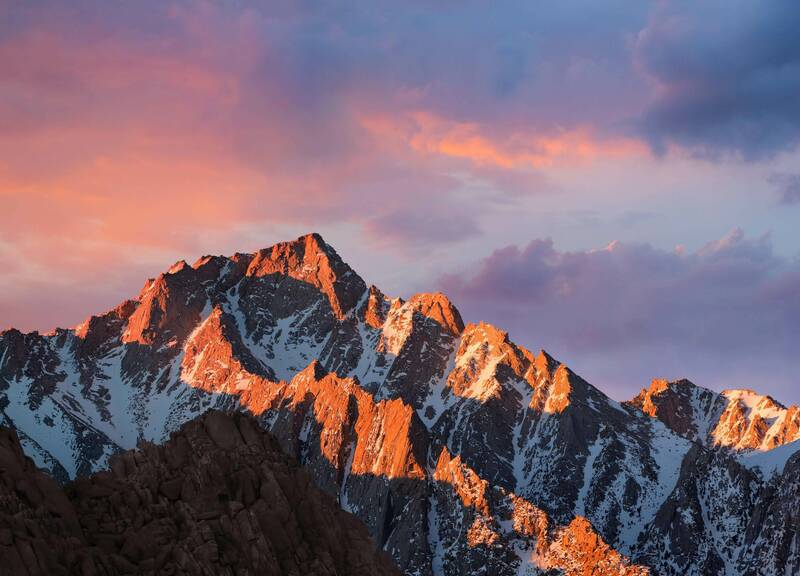 The first ascent of the North Ridge took place in September 1952 by Art Lembeck and Ray Van Aken. Since then many variations of the original line have been climbed. 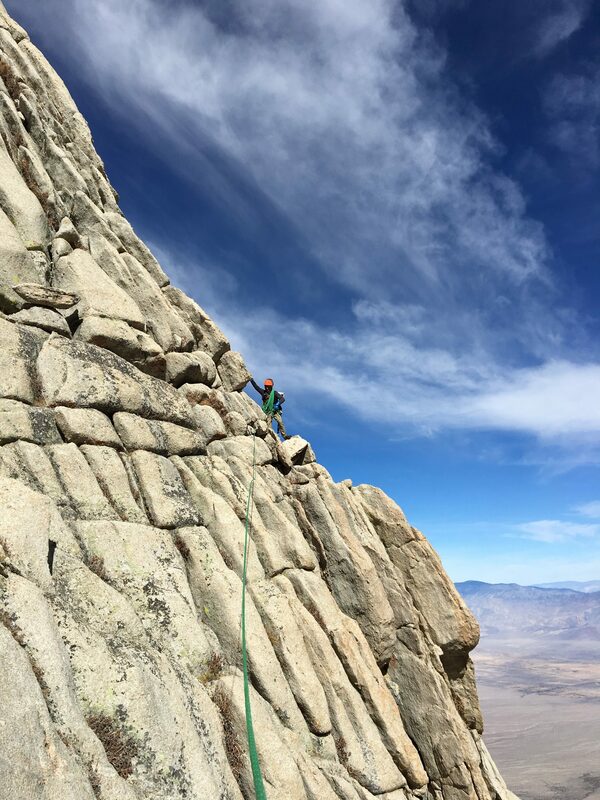 The ridge is so vast many spectacular and unclimbed lines could be climbed on your way to the top. 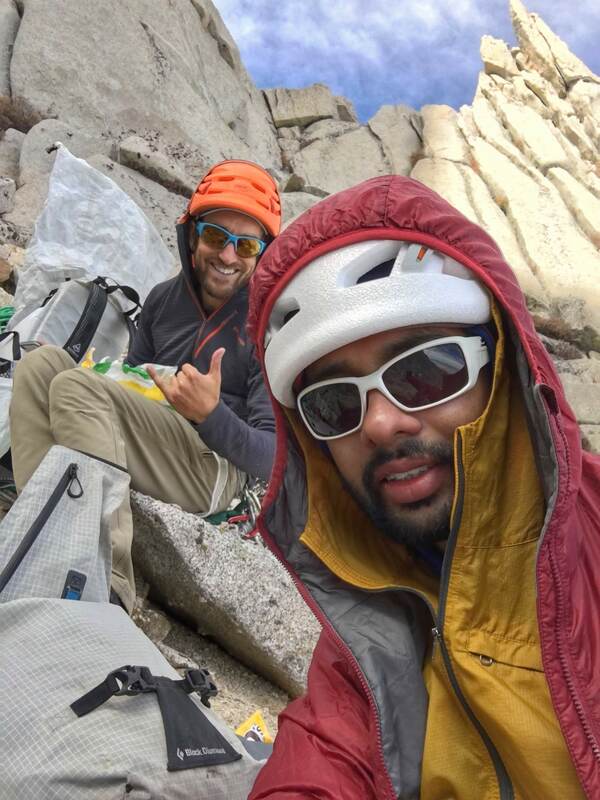 The force was strong in us two-weekend warriors as we battled the insane Friday traffic from San Diego to Lone Pine, slept 4 hours in the secret bivy spot and started from Meysan Lakes trailhead at 5 am. We quickly hiked past the well-maintained trail to the cut off at around 9,700 feet. 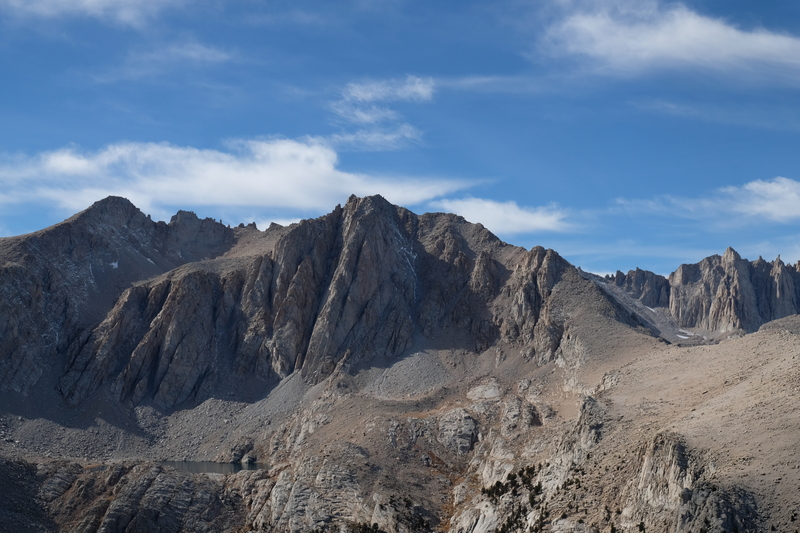 Here we filled up on water, ate some breakfast and moved on towards the goal for the day the North Ridge of Lone Pine Peak. 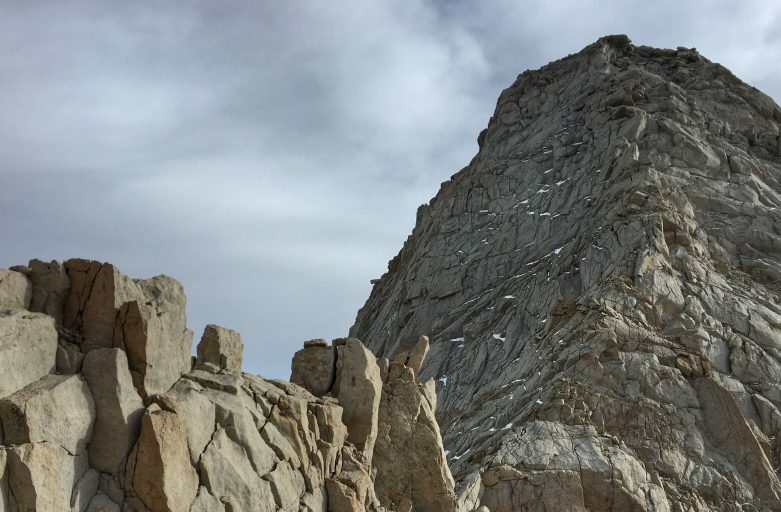 As I have mentioned before the North Ridge is of gargantuan proportions and is a complex affair with many gendarmes, steps, crests, notches, knife-edged traverses, and ledge systems of varying difficulty based on the route you choose. 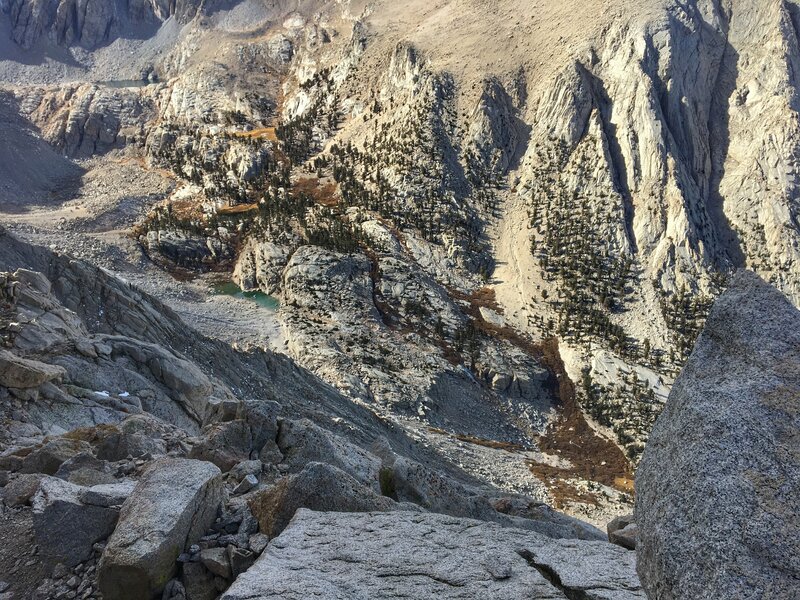 As this is a route best suited for the aspiring alpinist, part of the challenge of the route is to have the ability and mountain sense to be able to find the easiest climbable line. With this in mind, neither Scott nor I spent too much time reading various route betas, as it felt like compromising the fun and spirit of this route. 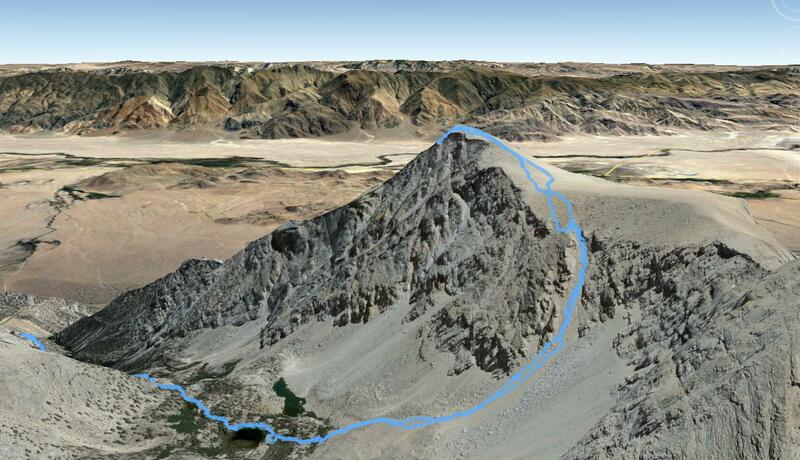 We both had a rough topo image of the route from Chris McNamara’s guidebook SuperTopo: High Sierra Climbing. Roughly speaking the ridge comprises of three towers and a summit headwall. Simply climb the tower till you can climb no more, traverse the ridge crest, descend down a notch which will then lead you to the base of the next tower. Repeat the process till you are standing on the summit and do it via the line best suited for your skill level. The climbing may be exposed but is easy and the rock quality is great. Based on your comfort level it is optimal to solo or simul-climb. Applying this same approach, we made our way towards the summit enjoying the breathtaking views and admiring the aesthetics of the line. 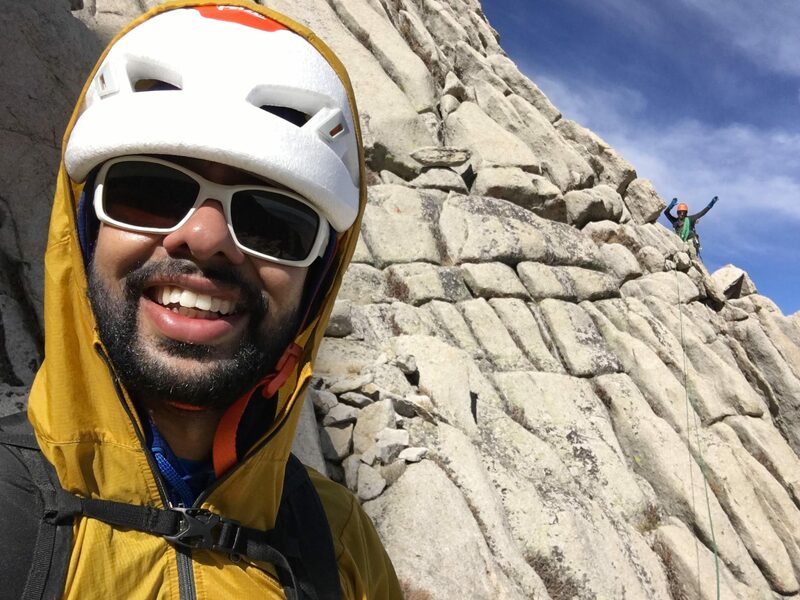 When I look back at our climb what baffled me the most is the fact that even though the climb is rated an easy 5.5 Yosemite Decimal System (YDS). Almost every guidebook/online resources shamelessly mentions a 5.7 lieback section and a 5.7 off-witch crack. I take issue, not with the difficulty of the climb but with the sheer fact that having the easiest section at 5.7 on a route automatically makes that route a 5.7 based on YDS. The ridge is exposed with breathtaking views on both sides! Summit headwall, we are going up that way! Time to eat some Subway! 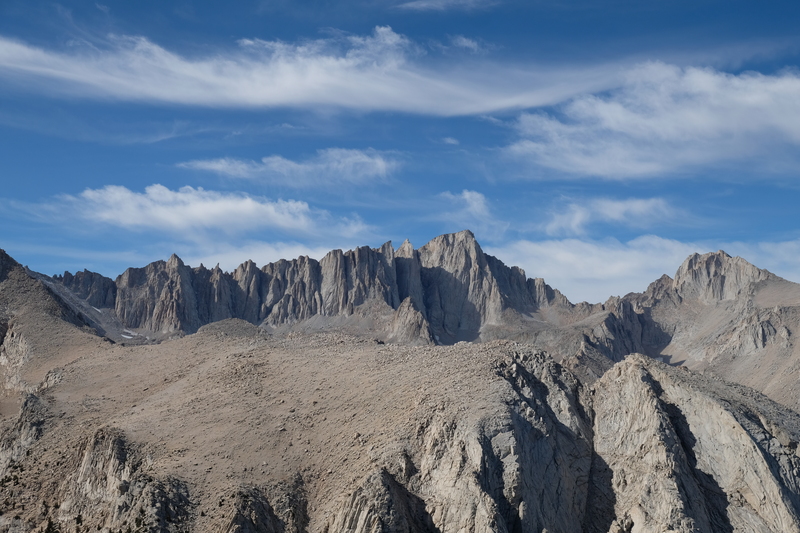 Visible in the distance, Mt Whitney, Mt Muir and the rest of Mt Whitney massif as well as Mt Russell. 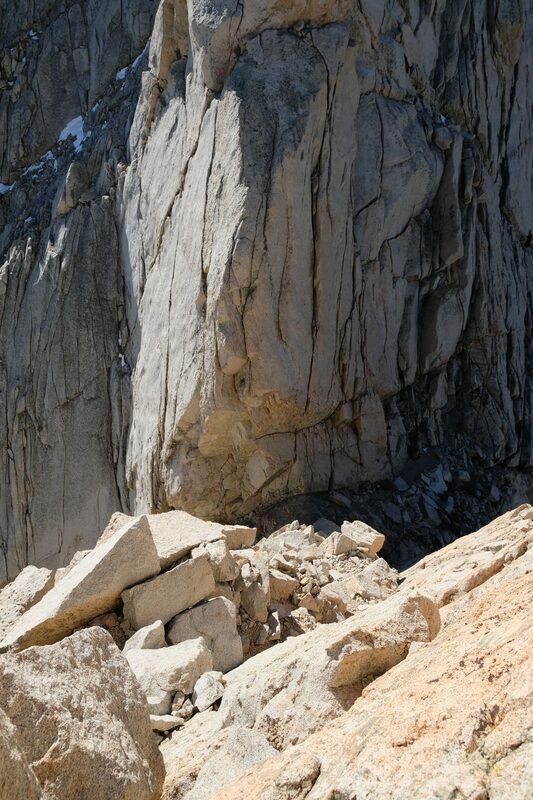 The descent from Lone Pine Peak can be very tricky! Many people have descended down the wrong chute only to later find that it cliffs out. With loose rock, talus and scree there is usually no solid rock to rappel from, the only other option left is to climb back up and hunt for the right chute. 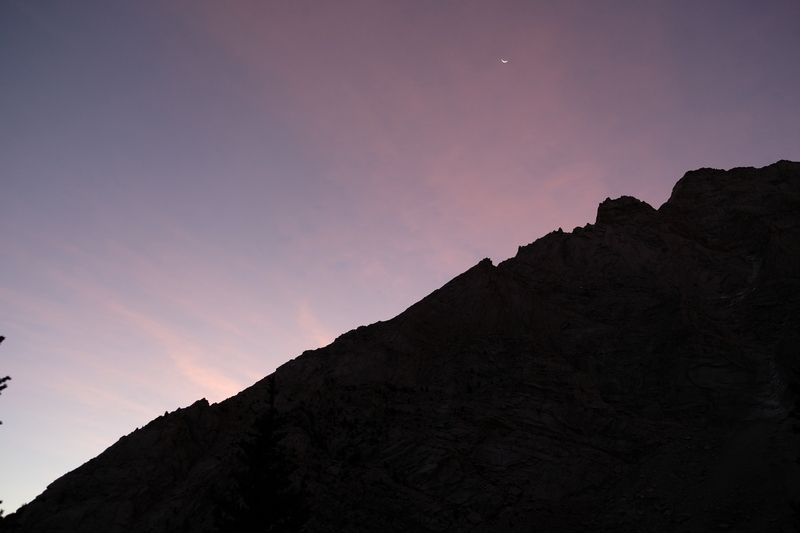 This can be especially challenging if you are descending in the dark. Come prepared with GPS coordinates or a route marked out in your GPS device, as we did. A good place to get the GPX file is Peakbagger.com. 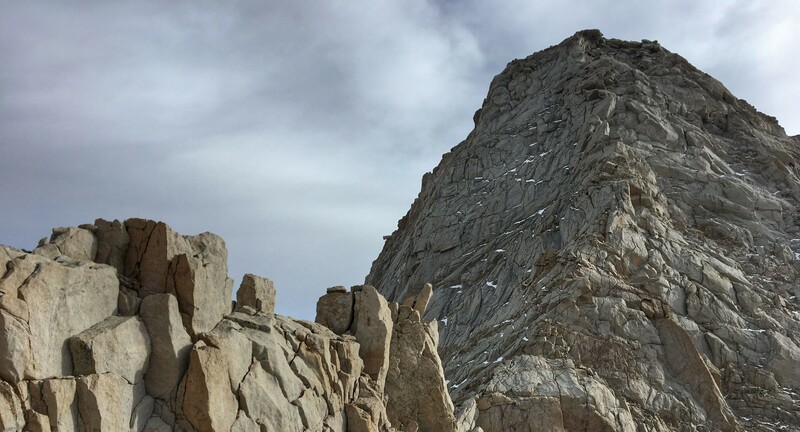 Please also read Mark Thomas trip report about his complete North Ridge climb and his misadventures and wanderings, looking for the right chute to descent. Great report! FYI, Ray Van Aken was my climbing mentor and taught technical climbing to us founders of the China Lake Mountain Rescue Group. 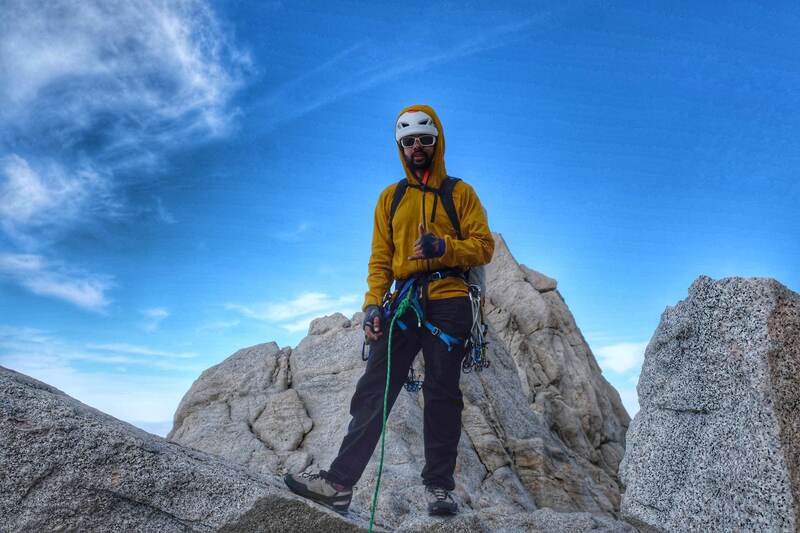 He was tech climbing advisor for and appeared in the movie “Three Secrets”. He was an Aerodynamics Professor at UCLA and an aerodynamicist for the US Navy. He was a great teacher and person. Awesome pics and excellent write up! I wish I could write TRs like you do, definitely a time commitment – kudos Ash!! !